How you experience the world is in the privacy of your own mind. You reign supreme power in your own inner kingdom, so pay close attention to what kind of mental environment you’re creating for yourself. Our thoughts can be our worst enemy, if we let them. Creating greater peace and confidence is dependent on your ability to manage your thoughts, after all, this battle can be won because we have the power of choice. This Native American Indian Legend has stood the test of time – and with good reason. Celebrated for its potent simplicity and widespread applicability, the story of Two Wolves resonates with everyone who reads it. In its essence, it teaches us that negative thinking is perfectly normal. But, we should never underestimate the dangerous power of fostering a negative inner dialogue. At a minimum, negative thinking can overwhelm our positive thoughts, destructing any and every good thought in its path. 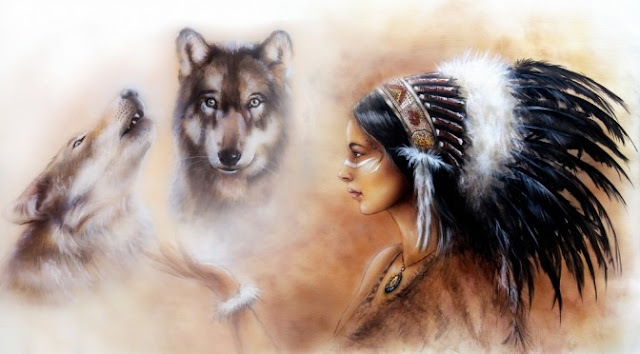 An old Indian Cherokee chief used a fable of two wolves to teach his grandson about life. To create a beautiful inner environment, you must become the gatekeeper of your mind. Altering your mental habits and inner dialogue is no easy task. A conscious mental referee is the secret to happiness; only letting in good positive sources that serve you. In fact, without constant mindful reflection, you may have unknowingly built up a web of unhealthy thought processes. The constant heavy consumption of stress-inducing and anger-provoking material isn’t doing your mental well-being any favors. In fact, the constant mental saturation of ‘junk food’ will rapidly transform and rewire your mind, for the worse. Stop that cycle now. You hold the power to change the quality of your consciousness. Write down all the ‘mental junk food’ you consume (this includes all the material that feeds your ‘bad’ wolf). By writing them down you will become mindful of your habits and able to pinpoint areas of your life that don’t serve you. For each item, try cutting out or minimizing it for two weeks. Check in often on your inner dialogue. Has anything changed? Is the ‘good’ wolf gaining traction? This simple mental cleanse mirrors that of the story of Two Wolves. By honoring and respecting the power of negative thought processes, you’re able to strategically win the hard fought battle of mental well-being.